Gum Spirits of Turpentine .... A pure and easily-made essential oil (solvent) much utilized within the historical practice of early and golden-age oil painting. Mayerne wrote in his Manuscript of many artisans of his day, including oil painters such as Rubens, van Belcamp, Vandyke, the Gentileschi, and Lanier. This friendly French physician delighted in meeting with craftmen and hearing of their practices. Fortunately for we inquisitive minds of today, Mayerne was quite successful at his enjoyable venture. He would visit each painter in their studio or wherever they found convienent to meet. In one particular case, Mayerne commissioned Peter Paul Rubens to paint his own portrait (which still exists). Yes, the physician regarded these interactions highly; and he recorded copious notes about the varied practices of the numerous painters. As such, Mayerne's manuscript allows us an invaluable glimpse into the painting-practices of early 1600's Western Europe --the historic crucible of great painting craftsmanship. Essential oils are the liquid essense of materials generally produced through the distillation of plants and minerals.Very important to the subject of this research into the early use of essential oils, a perusal of Mayerne's notes shows there was a near-universal use of essential oils by those painters he interviewed within that long lost golden time period of great oil painting (the father and daughter Gentileschi being anomalous). This common use of essential oils continued up through to our own time, though it has waned somewhat within the last decade due to increasing health-concerns propagated around solvent-use. Early oil painters were well aware of that eventual sombering tone that might overtake their exquisite colorful productions. They knew the primary culprit to this malady was the oil. Thus, there was general agreement, primarily in the North, that oils should be kept to a bare minimum --merely enough to conjure a stiff paste with the pigment --and this being necessary to avoid future yellowing in the damp and darkened homes of the clients. 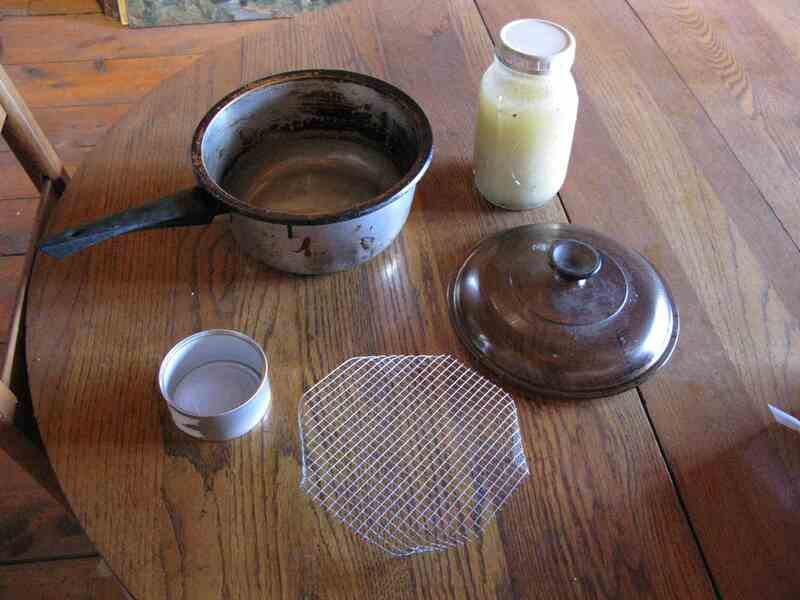 In fact, all sorts of remedies had been adopted to treat the oil or keep the colors lean of that fixed substance. Some painters rubbed-up their colors then stored those in pots covered in water; and this helped slough-off the extra oil and lean the color. Some also believed in "washing" the fixed oils prior to use. In sunnier climes, painters placed their works out into the sun and the dew, so as to oxidize away the superfluous oil from the paint-surface. Thanks in part to Mayerne's recorded words, another route can be discerned or dissemenated by the sleuthing reader-researcher. It's a simple system and well suited to layered works, which was the accepted practice and means to the finest realism in that earlier time. This system involves the use of four ingredients, which are these: Oil, pigment, a proper varnish, and a proper solvent.. Regarding the essential oil, that solvent should be an exquisite spirit such as the one mentioned by Rubens on that serendipitous occasion when he painted Theodore de Mayerne's portrait. In that particular time and happenstance, Rubens told Mayerne that he personally preferred a spirit of turpentine made by heating the balsam (the raw oleoresin) in a "bain marie", which would be a simple water-bath. In other words, Rubens, or an apprentice, cooked that oleoresin upon or within boiling water, as opposed to exposure to an actual flame -- the later mode being the historically most common practice for distilling gum spirits of turpentine. Rubens slight mention of his own solvent-use is extremely important to oil painting history. Myself, I consider it a bonifide miracle, for his few words to Mayerne also provide us direction towards a great mystery; which is, what did Rubens use to bind his paint? But about Rubens' preferred gum spirits of turpentine: this author-painter-varnish-maker is here to inform the reader that Rubens choice was and is the perfect solution; for there is no finer essence, more pure and less harmfull essence, more pleasant to the nose while being less oderous essence ... than what that great painter prescribed; nor was Rubens alone in knowing of it, for as I mentioned previously, Mayerne informs us that this coniferous-gum-based solvent was in common use within his day -- I might be prone to say this solvent-use activity was especially practiced within the Northern realm of Europe, did I not also know that the Italian journals of Richard Symonds reveal an also rampant use of solvents within the South. Turpentine spirits would be especially popular because every oil painter could make some for himself and right in his own studio --and I will add, very simply so. The feat required nothing more than a cooking fire, some common implements, and the necessary amounts of pine oleoresin (AKA sap, gum, "turpentine" or "balsam"), which of course could be had in good quality nearly ...well ...everywhere within that time-period (and well before and afterwards). "Turpentine" or "oleoresin", or "pine gum", or "pine sap" was collected wherever good conifer forests grew -- which was pretty much everywhere. It was far and away easier to obtain some oleoresin than spike lavender. You see, oleoresin has been collected for so many centuries and for so many uses. The sticky raw sap was so very common. It was an intrinsic building block for civilization! Pine oleoresin was especially prized in activities involving the oceans, so much so as to eventually become known as "Naval Stores". Every shipping port had to have it. Drums and kegs of it abounded. It was used to make everything from illumination, to course adhesives, to medicines proper for the gut, skin, and hoof ... and, in our own profession, for durable clear varnishes praised for the final effect given to either tempera or oil paintings. Rubens specified a certain type of oleoresin but just about any lightly-colored pine, fir, or spruce sap would do duty for extraction of a very fine and ethereal solvent -- a fluid that would thin the colors yet evaporate and leave no noticeable trace. I'll repeat that: The sovent would leave no noticeable trace of its use as a diluent. The reason behind my echoing statement is this: I have read of certain good oil painting sleuths claiming Rubens' spirit of turpentine was of a primitive and inferior quality, such that its use would very likely have left traces of itself within his paint; and that these traces are yet detectable today by use of the current 'state-of-the-art' analysis equipment and methodologies. Again, this is the touted rationale for the so-frequent finding of "a little pine resin" in Rubens' paint-chips. I'm here to inform you that, thanks to Mayerne's contrite but invaluable recording, that derelect claim is necessarily more of a contaminant to this issue ...than Rubens' "primitive" solvent. I will share, it is not plausible that the contested trace of pine originated and remained through Rubens' use of a pine-based solvent. Instead, it may be now fairly decided --by extended inference --that Rubens did, indeed, make use of some sort of pine-based varnish in his actual paint. Yes, I'll say it now: That frequent finding of "a little pine resin" must have originated within the actual BINDER of Rubens' paint, and not via his use of an inferior pine spirits..
And, by the by, there are numerous other great oil painters whose paint-chips frequently give-off that same finding of "a little pine resin". The name "Jan van Eyke" springs readily to mind. Gum Spirits of Turpentine is simply the essence driven off the heated gum from a pine tree. Some pines bleed quality oleoresin --sap --very quickly; thus they are valued for spirit-production. 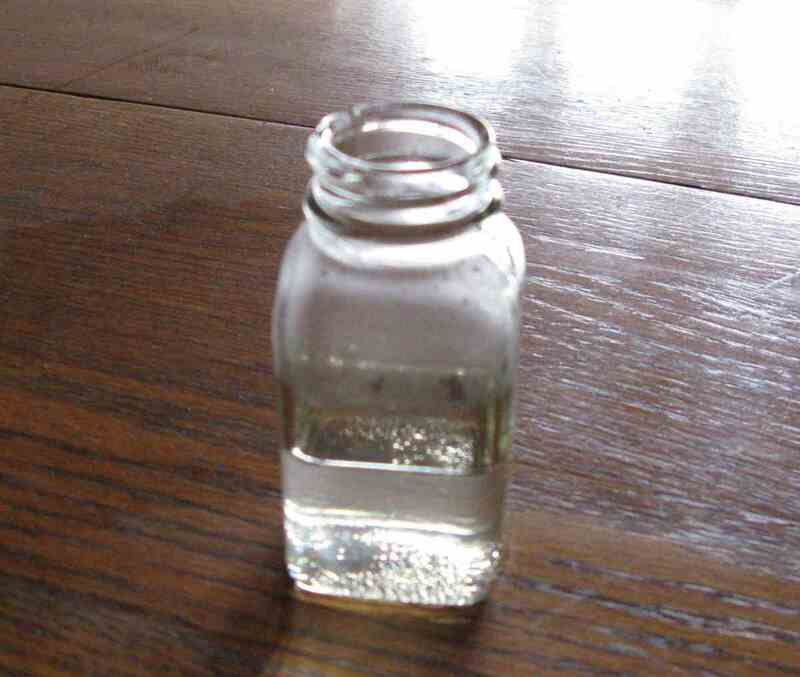 The unfortunate thing about regular gum spirits of turpentine is that, while this solvent has a pleasant scent, it contains oil-y and resinous contaminants, which will leave a sticky residue after evaporation. 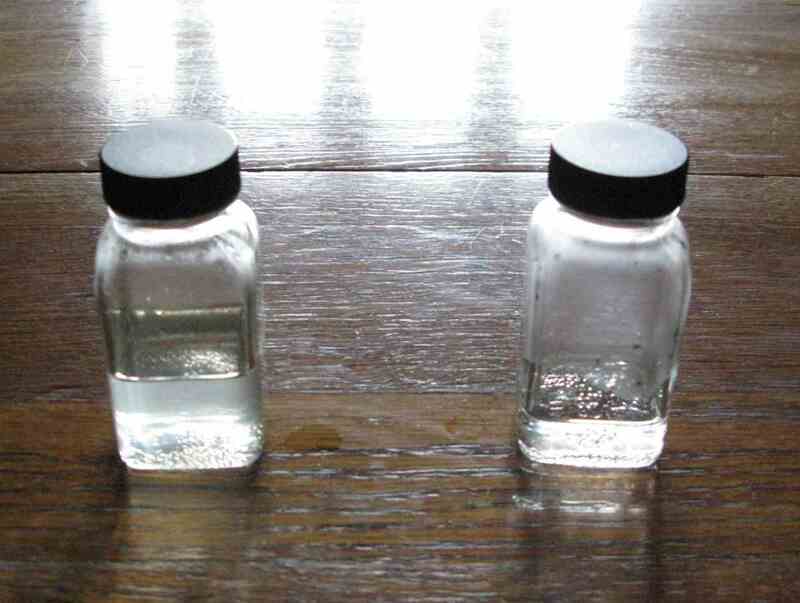 These contaminants also cause the typical gum spirits to eventually turn a dark reddish brown. I love gum spirits but knowing of its contaminants, I have always used rectified spirits in my own paint and varnishes. Re-distilling regular gum spirits at a lower temperature is one way to produce "rectified spirits of turpentine". 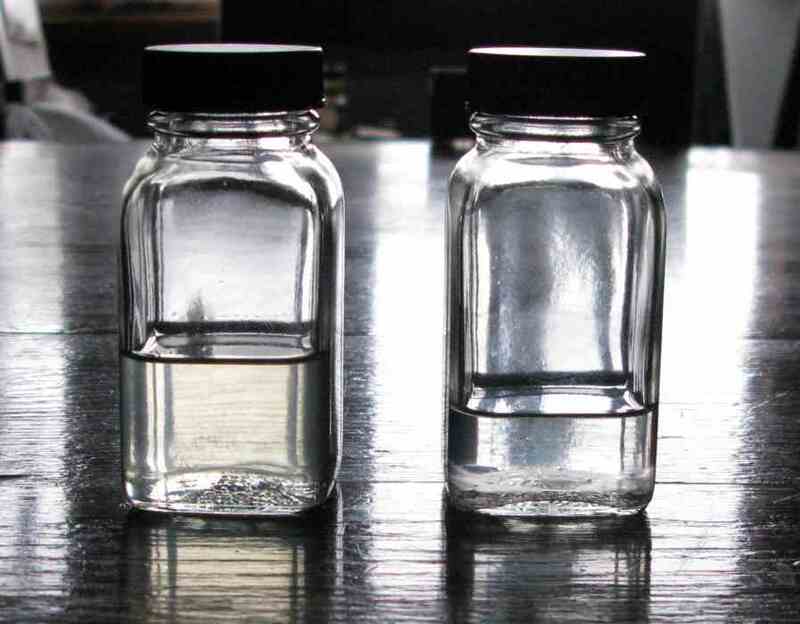 Rid of its contaminants, rectified turps is a non-yellowing "water-white" solvent; and it evaporates completely. But ... there is another way to obtain a pure spirits of turpentine -- and this may be accomplished directly from the raw gum, such that it contains no darkening impurities to begin with. I will here state that Rubens knew of this manner. As I wrote, making gum spirits of turpentine is simple. The ancient Greek philosopher, Pliny, made it by covering a hot pot of oleoresin with a fleece; then afterwards wringing the spirit-sodden fleece over a basin. Some might imagine a need for a proper "still" with the coiled tubing and all that. That would be nice but I came up with another method. Using my own elementary knowledge of distilling I put together a device to collect spirits from raw pine oleoresin. I call my invention a "Groves' Gum Spirits Generator". Is this the same apparatus used by Rubens? He didn't say; but again, this is just to show the reader how simple it was and can be to obtain an excellent gum spirits for painting purposes ... and --very important to my case here --a gum spirits that would leave no trace of itself as it evaporated from the applied paint. Above: Everything needed except a heat-source: At top, left, is an old aluminum cooking pot to hold the thick sticky pine oleoresin. The pine 'oleo' (in this case, the gum is from the typical American "slash pine", AKA Pinus Elliottii) is that whitish gunk in the quart mason jar. A piece of thin metal screen (AKA hardware cloth), center foreground, will serve to elevate the spirit collector above the simmering oleoresin -- which is that cat food can at left. The spirit-attracting condenser will be that tapered glass lid, though any metal or crockery lid that will allow the gathering and condensing fumes to run down towards the interior center of the pot will fill the role --as long as the fit with the pot's lip is good --I do not want the vapors ("spirits") escaping from my "spirit-generator" into the studio. Above: I'm pouring about a cup of the oleoresin into my pot. The oleoresin is opaque due to having water within its content. For reference, this gunk is correctly and historically known as "turpentine" or "turpentine balsam". Most folks won't know this as modern users have commonly but incorrectly referred to the spirits as "turpentine", when, in fact, that word has always been intended for the sap. 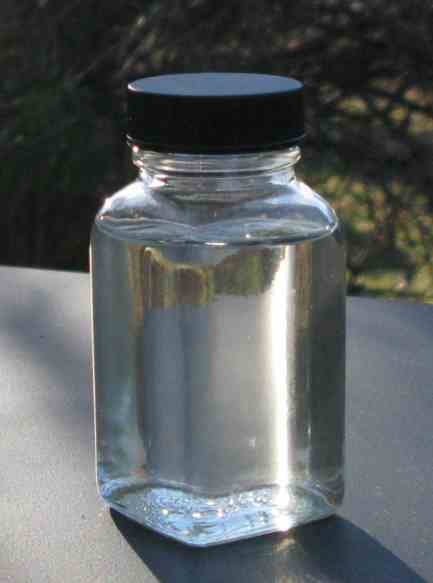 The solvent or "spirits" are what evaporates off the turpentine. Thus the correct title should be "Gum Spirits of Turpentine". BTW, the more fluid the originating balsam, the more spirits may be recovered from it. 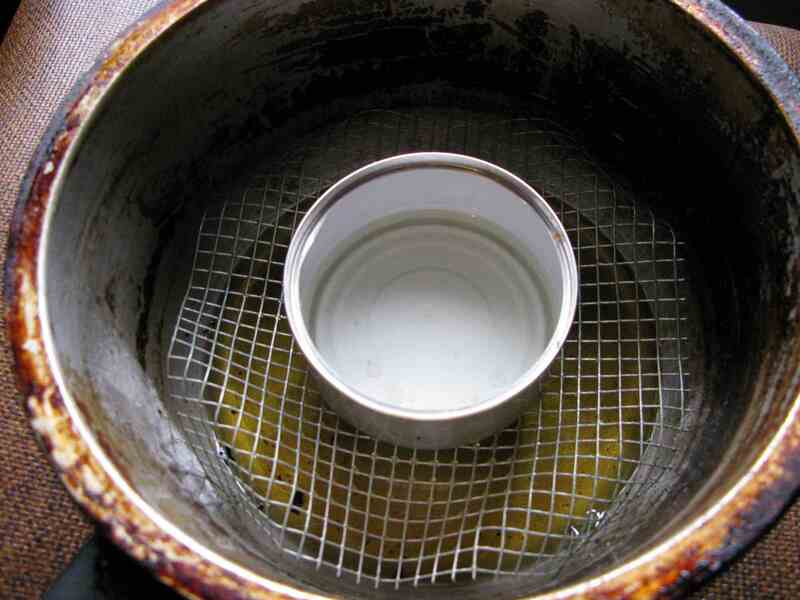 Above: I place, bend, and adjust the thin metal screen into the pot to support my collection cup. 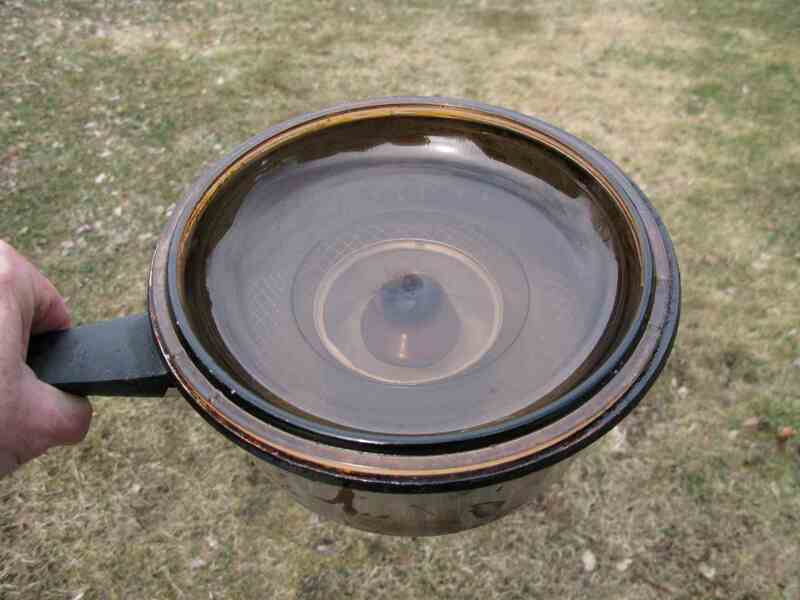 Above: Everything assembled and the lid placed on upside-down to direct the condensing spirit central and downwards into the underlying collection-cup. I'm using ice to encourage the condensation beneath the lid. I'll add ice and spoon-off water as the process occurrs. Snow and replenishing with cold water also works. It will even work with no water but the process is speeded by that simple addition. Think of a cold soda bottle on a hot humid day, and that lovely water ring it leaves on your lacquered furniture. But, again, you want to keep the contaminants from infecting your spirits while that is forming inside your collector; and so you should keep the heating down as much as possible. 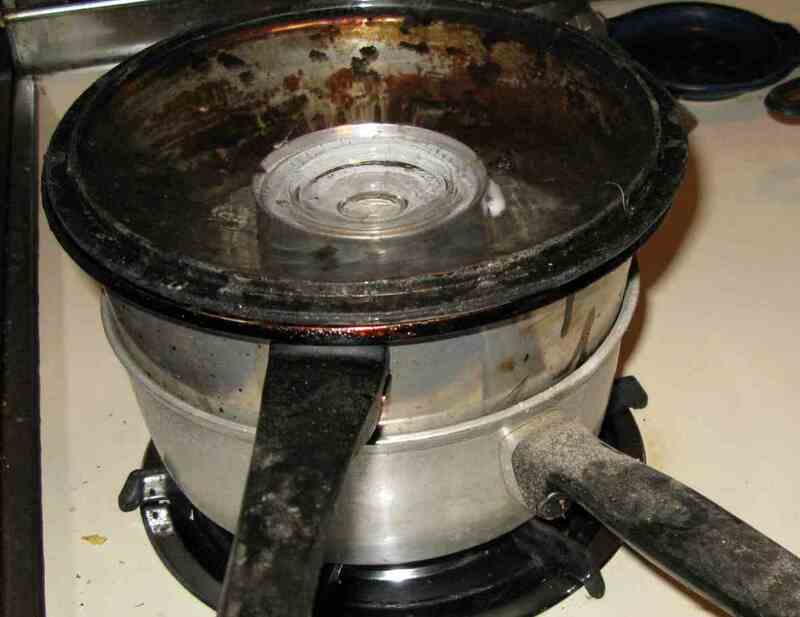 Realize, even the soft sound of water exploding inside your pot means you are vaporizing contaminents. Again I stress that once you've produced contaminated gum spirits, the only way to rid that contamination is through "rectification", which can also be accomplished from adding something like a bit of sulphuric acid and shaking the whole. The acid attacks the contaminants which then slowly settle out of suspension. Above: As you can discern I now have some gum spirits of turpentine in the collection cup. Unfortunately, due to the direct exposure of my pot to the flame, that muffled spattering sound was heard. The process did go quickly -- about 20-minutes -- and at one point I was counting a drop of spirit about every 2-seconds. Appearance-wise, it seems like good quality spirit in the cup. 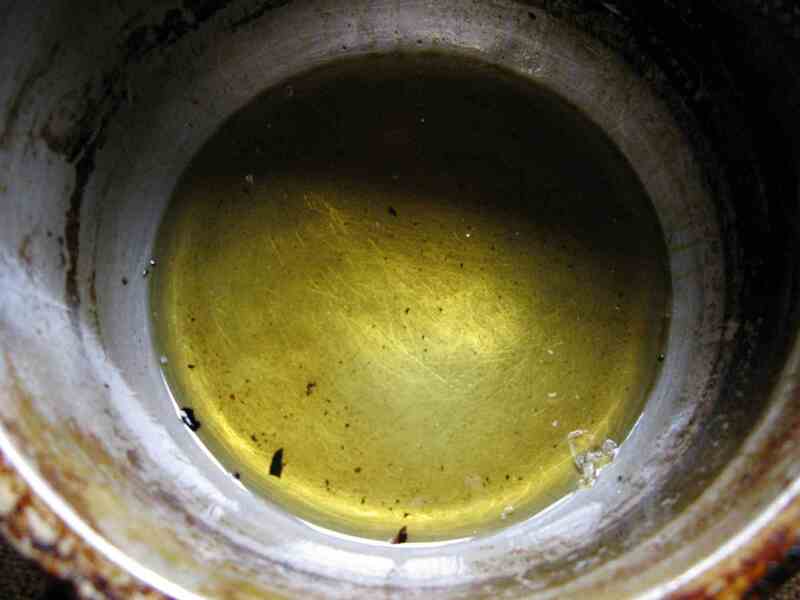 The remaining resin, or "rosin", is that now solidified clear glassy yellow layer beneath the metal mesh. Above: I spilled some but still obtained nearly half a bottle. There will always be a slight amount of water in the cup, too, but that's harmless to properly-bound oil paint -- though you can carefully separate that moisture out. The collected spirits smell delightfull! Unfortunately, my gum spirits contains those heretofore mentioned contaminants; and so you see what I have collected is nothing more than common gum spirits of turpentine. As this basic "turps" ages, it will likely turn reddish-brown and always leave a resinous residue. This is not Rubens' spirit of turpentine; and you'll soon see the difference. Can these spirits be used for painting or varnish-making purposes? Yes ...but Rubens specifically told Mayerne that he did not use this. Above: Now I'm going to make some spirit as Rubens said he did. By his own mention, Rubens was obviously aware that the most pure and ethereal gum spirits were those that arose from the weakest heating; and thus, the exposure of the raw gum to a direct flame was absolutely forbidden. Recall that Rubens told Mayerne that his gum spirits were "distilled in a bain-marie" --a water bath. So, to recreate Rubens' preferred painting solvent, I'm placing my generator into another slightly larger pot, and this one is partially filled with water, such that the bottom of my collector is slightly immersed at the beginning of the cook. In fact, I have effectively assembled what is termed a "double boiler". This water-bath will insure a uniform and mild heating of my olioresin; and in fact the raw gum will never rise in temperature to even the boiling point of water. Thus, that most ethereal spirit will drift lazily off the hot pine-gum, condense upon the underside of the cooler lid, then run down and drop off the knob into my collection cup at a much slower rate. Accelerants and resinous/ oil-y contaminents will remain in the hot gum. Again I use the very lowest burner-setting. 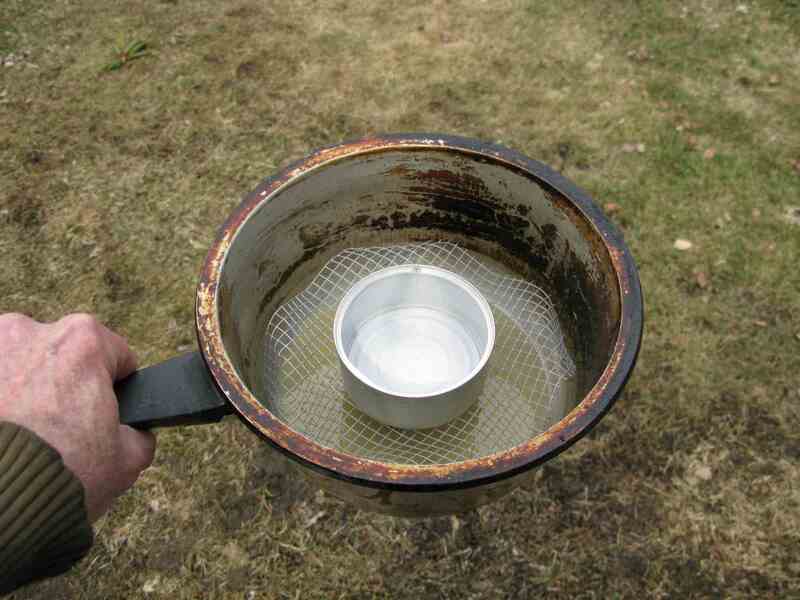 The only thing that may happen is that water may escape from the sides of that bottom pot. 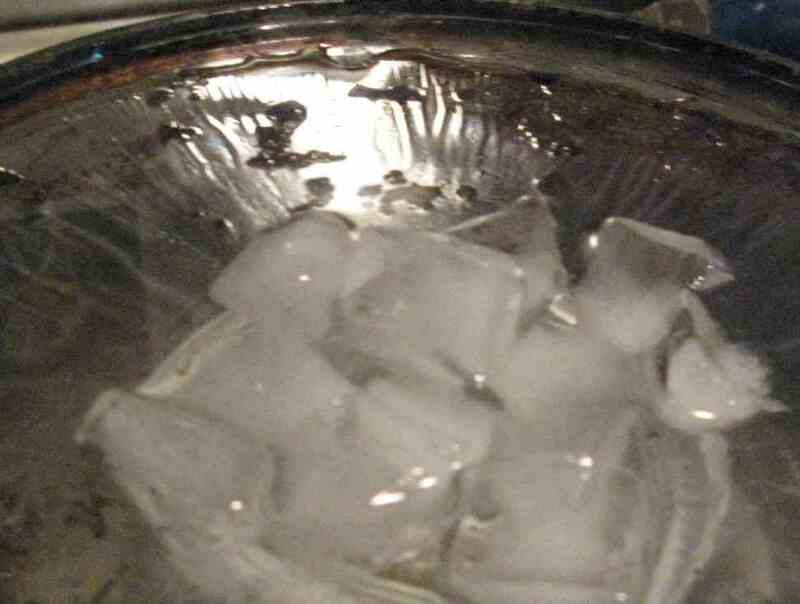 Above: Ice and water on the lid. This time a cold surface greatly improves formation and collection. You can see the numerous running trails of the condensing spirit as it travels down the underside of the lid and drips into the collection cup. The fit of my lid to my oleo-containing pot is so perfect that I never even smell the essence being generated. At its fastest rate, I was getting one spirits-drip every 6-seconds; though it slowed greatly as the gum finally gave up its lightest essence. 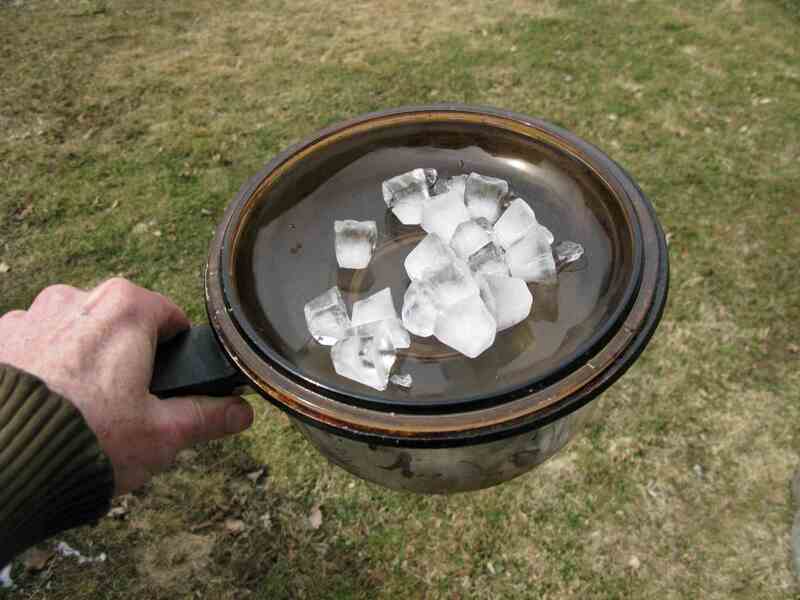 The first time I did this I replenished with a lot of ice. Cold water poured-in after spooning-off works, too. After 25 minutes of cooking I open the generator to see the results. I poured-off my scant collection into another bottle then reassembled the device and returned it to heating. 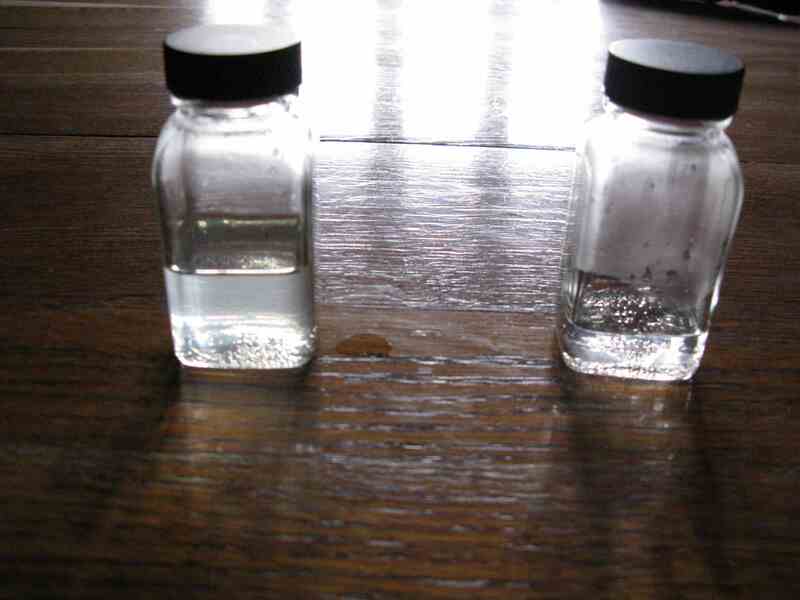 Take a look: Regular classic gum spirits of turpentine on the left versus Rubens' gum spirits on the right. Quite a noticeable difference. The Rubens' version is water-clear. 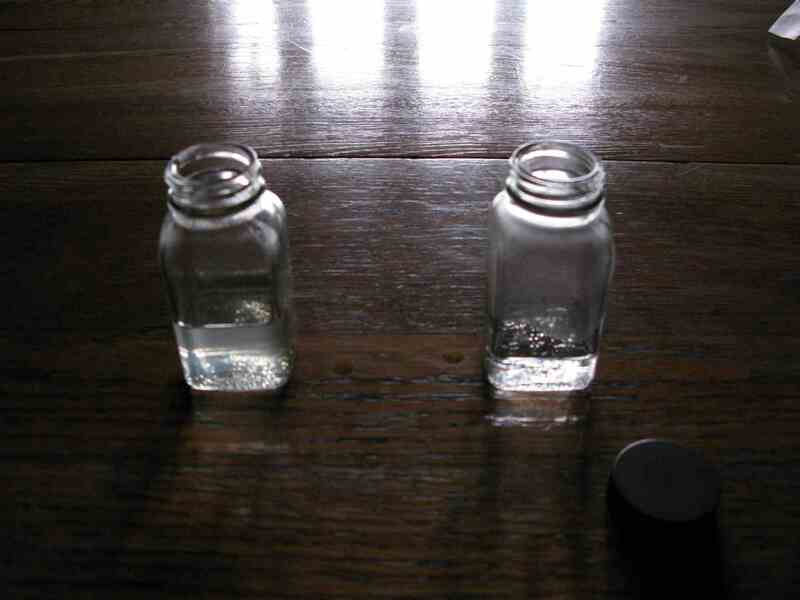 I dip my knife into the spirits then place a small droplet on the table next to each bottle. Above: Gone! The regular gum spirits of turpentine leaves a faint but noticeable gummy remnant while the Rubens' water-bath spirits appears contaminant-free. Why? Because the uniform lower heating temperature has only driven the lighter and more ethereal spirits from the oleoresin. Curiously, the Rubens also has less of a smell, though both spirits smell absolutely delightful to the nose. I barely imagine any painter complaining over the faint aroma of either version . Above: 12-hours later. This is a comparison of the resulting gum spirits. The regular gum spirits is faintly yellow. Rubens' version is amazingly clear. One final observation concerning "Rubens' Turpentine" is this: The relative ethereal lightness or purity of turpentine spirit can be easily judged by its ability to hold water in suspension. 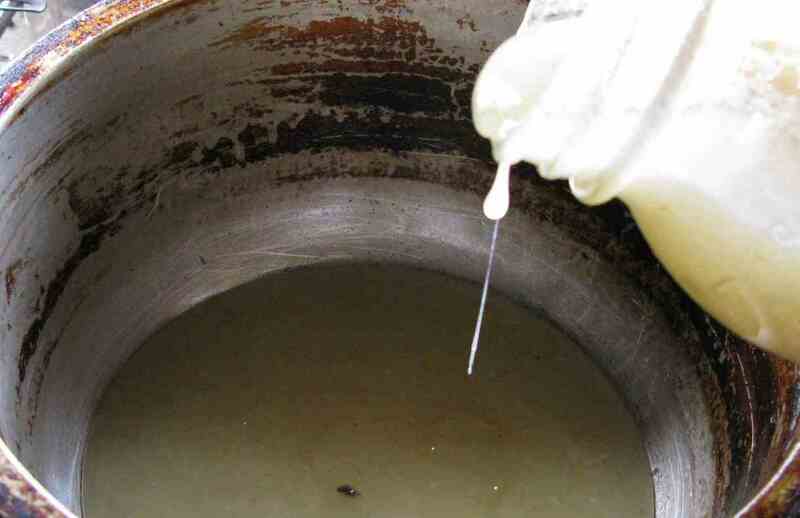 Regular gum turpentine does not take up water easily due to its resinous contaminants. What surprised me is how easily the water-bath-generated spirit combined with and retained moisture. It's performance also beat rectified spirits at this test. The Rubens' spirit is very ethereal. At this point, I am hopeful that anyone carefully reading this trial will understand the amazing purity of P.P.Rubens' chosen diluent. Will they still believe Rubens used a poor grade of gum turpentine spirit, such that it would leave "a little pine resin" in his paint? Thanks to the invaluable notations recorded by Mayerne, Rubens, himself, has assurred us that he used a very pure gum spirits; and he did so by his inclusive mention, "distilled in a bain-marie". And so, where did that pine resin finding in Rubens' paint originate? If you have not read it before on my website, Peter Paul Rubens also told (and showed) Mayerne that he (Rubens) added varnish to his colors, I may now fairly conclude that Rubens' varnish must have been based --at least in part --on pine resin. For further reading on this issue, my report on Origin and Fir Wax can be accessed here. For those who might be curious, I will not be offering "Rubens' Gum Spirits of Turpentine" on my website; but I have shown how readily and easily such a solvent can be made. (1) Disclaimer: This research is intended to show the simplistic creation and easy availability of gum spirits of turpentine to the realm of early oil painting practice, with a focus towards the relative purity of that particular gum spirits used by Peter Paul Rubens --a solvent fully equal to the best rectified gum turpentine of today's manufacture. The author neither encourages nor discourages personal creation of gum spirits of turpentine. (2) Those who have for many years used my historical mediums and varnishes will know of this author's acceptance to what he early-on termed the "all-oil technique", which elliminates solvent-use for those who cannot tolerate or simply prefer not to use such. Of course, I have promoted the use of nut oil over linseed for such purpose, especially in relation to layered workmanship; and always with the adjunt of a resin varnish. (3) In direct contradiction to Mayer, Doerner, and Massey ("Formulas for painters"), the author never recommends anyone using cold-mix combinations of balsams with oils. Such cold-combinations generally lead to future yellowing as well as easily-dissolved paint. The best manner of combination is to thoroughly heat the balsam with the oil, which will effect a much more perfect union while driveing-off the contaminants. (4) I should point out that some varnishes perform amazingly with this solvent method of painting. Then again, some do not. I have found the very best performers to be those that congeal the paint. Also note: By 'decent varnish' I intend one that is either an excellent spirit-based varnish or, if it is an oil-based resin varnish, one that has a minimum of the darkening fixed oil contained within it. Of course, it must also be formed by one of the tried and true resins, those that show no real darkening when stored in light or darkness -- of which I have found there are many, i.e., Baltic amber, Agathis copal, many light pines and spruces, and some firs. Some might add larch to my own list but I personally have no thorough experience and study with that. (5) Whatever some foreign manufacturers are using today to extract gum spirits results in their product having a very foul odor, which to my nose resembles a cross between ether and diesel fuel. It's awful! No painter should tolerate that nonsense in their studio. Click here to to go back to our Mediums page.